As USD is supported by some economic reports such as durable goods data and the unemployment claims data, traders are waiting for advance GDP data which will influence GBPUSD. 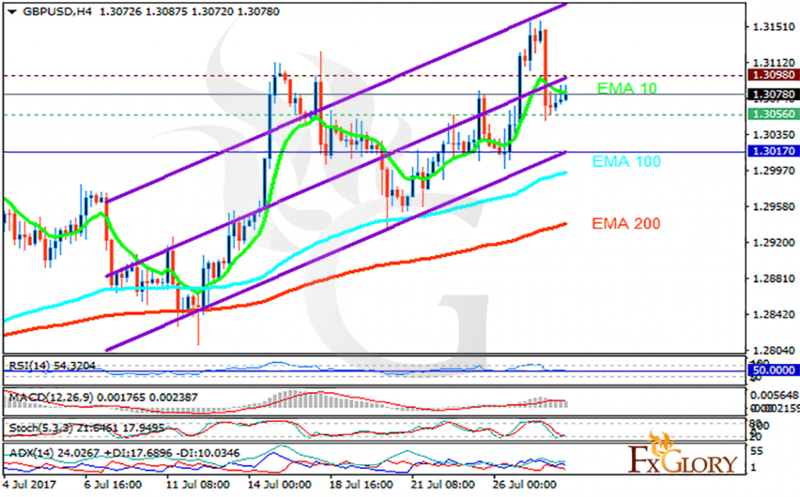 The support rests at 1.30560 with resistance at 1.30980 which both lines are above the weekly pivot point at 1.30170. The EMA of 10 is moving with bearish bias but it is above the EMA of 200 and the EMA of 100. The RSI is moving horizontally on the 50 level, the Stochastic is moving in low ranges and the MACD indicator is in positive territory. The ADX is showing buy signals. Considering the USD empowerment, short positions are recommended targeting 1.2950.